When it comes to deals for all sorts of free food, few major holidays come close to the feeding frenzy that unfolds on Halloween every year -- and that's true even before you count the avalanche of candy. And while there's a good chance you already busted out your dancing hot dog costume for parties over the weekend, Krispy Kreme just provided another good reason to dress up for Halloween on Tuesday: free donuts. 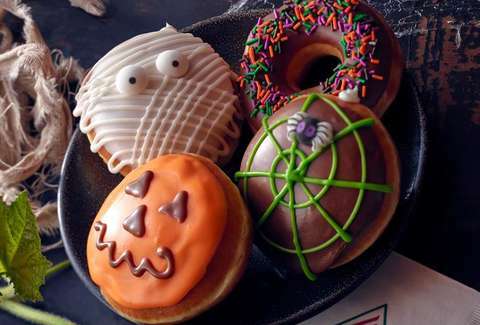 As with previous years, Krispy Kreme will give you one free donut of your choice -- even a special Halloween donut -- if you show up in your costume at one of the ever-popular donut chain's locations in the United States and Canada on October 31. The offer is good for one donut per person at most Krispy Kreme locations (check before you go), excluding shops located in Iowa, Louisiana, and Nebraska as well as Mobile or Foley, Alabama and Jersey City, New Jersey, according to the company's official Facebook event. You don't have to buy anything to get a free donut, but depending on your costume, you may have to part with a little dignity for the treat. Of course, a single free donut isn't exactly worth the time and effort of transforming into, say, Salt Bae, but swinging into your local Krispy Kreme makes much more sense if you're already planning on dressing up -- maybe to take advantage of Chipotle's $3 "BOO-rito" deal, too -- for the occasion. At the very least, you'll have something better to eat than candy corn. Tony Merevick is Senior News Editor at Thrillist and literally dressed as a box of Krispy Kreme donuts for Halloween. Send news tips to news@thrillist.com and follow him on Twitter @tonymerevick.